Walking out to the parking lot after work today I looked up to the sky and saw the clouds. But, being from New Mexico, I realized it probably wasn't really going to rain. It's one of those songs folks my age and older have just known all our lives. I probably first heard it on a Bugs Bunny cartoon. 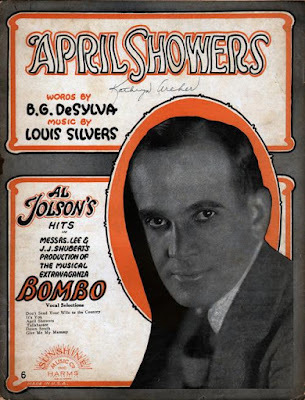 But the song, written by written by Louis Silvers and lyricist B. G. De Sylva, goes back to a 1921 Broadway musical called Bombo, starring a young Al Jolson. "April Showers" became one of Jolson's signature songs -- though it wasn't identified with him nearly as much as "My Mammy" or "Swanee." So let's start with the Jolson original. This YouTube version features a 1933 Betty Boop cartoon as a backdrop. I don't think it has anything to do with the song, but hey. it's a Betty Boop cartoon! I'm not exactly sure when Mel Torme shot this version with the Page Cavanaugh Trio. But it's pretty snazzy. Santo & Johnny, best known for their spooky classic "Sleep Walk," turned "April Showers" into a rock 'n' roll instrumental. But, about 14 years after Jolson first sang this tune, there was another song that had "April Showers" in its title, "March Winds and April Showers," written by Walter G. Samuels, Leonard Whitcup and Teddy Powell. Here's a 1935 recording by Abe Lyman & His California Orchestra, with vocals by crooner Louis Rapp.